Success may depend on a number of factors, but at the end of the day, what matters is whether you’ve done your best in order to reach the stars. You might be a talented, passionate soccer player, but if you don’t work hard on improving your skills, you can never become the most valuable player in your team. Coach Ben Nabers is aware of this fact and therefore offers you the opportunity to boost your game by training alone. 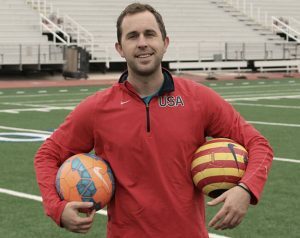 Coach Ben is the creator of Online Soccer Skills, a company that provides excellent soccer training programs for players of all ages. Read this comprehensive Online Soccer Skills review to gain a better insight into the company’s offer and determine which program is the right one for you. You want to trick attackers like Dani Alves, control the ball like Paul Pogba or strike as forcefully and precisely as Luis Suarez? Coach Ben and Online Soccer Skills can help with interesting solutions and useful tips for all players, regardless of position. During his amazing career, Coach Ben has worked with youth clubs and college, recreational, and professional players. In addition to helping more than 4000 players during his career, he continues sharing his wisdom online. Coach Ben is very active and comes up with new programs and training methods on a regular basis. This means that Online Soccer Skills always has something new to offer to their customers. Programs from Online Soccer Skills can be useful for parents and coaches as well. They don’t only contain tips and tricks for better performance, they also include advice on nutrition, fitness, and mental health. One of the main advantages of these programs is their diversity. There’s something for everyone, including tips on how to start training soccer, change your mindset, and polish your soccer skills. No matter how skilled and/or experienced you are, we’re certain that you can find something useful in Online Soccer Skills’ colorful offer to improve your performance and play great soccer. One more thing that makes Online Soccer Skills stand out is that you can subscribe to the programs. 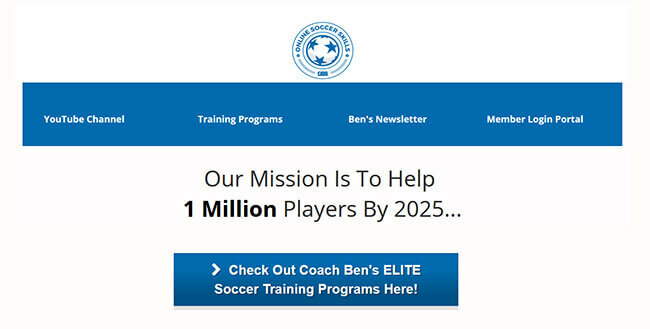 Since coach Ben and his team work hard on updating their assortment of soccer training programs, they encourage their customers to grow with them. 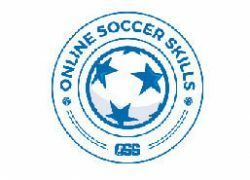 As a member of Online Soccer Skills, you get unlimited access to the program you’ve chosen. This means that you can read the PDF documents and watch videos from your training program whenever and wherever you want. The files are mobile-friendly, so you can use a computer, tablet or smartphone to follow your Online Soccer Skills program. In addition to extraordinary programs, Coach Ben offers a rich YouTube channel as well. It features videos with tutorials for better dribbling, passing, assisting, and scoring more goals, as well as tips on improving many other soccer skills. In some of the videos, Coach Ben shares the tricks of famous, successful soccer players such as Ronaldo, Messi, Robben, and many others. Online Soccer Skills offers you 24/7/365 access to the program of your choice. They provide 6 different soccer training programs at the moment, but they plan on expanding their offer, which is why you may want to consider subscribing to their newsletter or frequently visiting their site. Currently, you get to choose between The Complete Player Program, Skills Mastery, The Scoring Blueprint Program, The Self Development Academy, A to Z of Recruiting, and The Soccer Pre-Game Formula. The Complete Player Program is excellent for beginners. It can help you build a great foundation by working on your speed, stamina, ball control, shooting, and dribbling. With this program, your skills can become much better in just 8 weeks. Skills Mastery is a program specially designed for attackers. It includes 9 modules that help you enhance your control of the ball, strike more goals, gain more confidence, and play better in 1V1 actions. Skills Mastery can help you become the most dominant player in the field. The Scoring Blueprint Program is perfect for players who want to become goal-scoring masters. It provides excellent tips and efficient drills that can turn you into an unstoppable striker. The program lasts for 12 weeks and includes detailed instructions for successful training sessions. The Self Development Academy is made for highly responsible playmakers. This program can help you become a more confident player and develop the mindset of a true winner. A to Z of Recruiting is a recruiting guide for all players interested in playing college soccer. It provides numerous tips on improving your game, making a portfolio, and applying for a scholarship. The Soccer Pre-Game Formula is created to help every soccer player deal with the pressure of the upcoming game, expectations, and victories and failures. Mental health is as important as physical, so this is a program every serious player can find very useful. In case you would like to browse through all of these programs, you can subscribe to the All-Access Pass and read and watch all old and new publications from Online Soccer whenever you want. All individual programs cost between $67 and $197 while the All-Access Pass membership costs only $19.95 per month. In addition to that, Coach Ben offers you a 14-day trial period that costs only $1. You can read and watch the material provided whatever you want and if you decide that you don’t need a full membership, you can inform Online Soccer Skills of your decision and you will not have to subscribe to any of their programs. For everyone who isn’t a big fan of technology, there’s a published book by Coach Ben Nabers called “The Journey of Greatness,” which can help you on your path to success in the world of soccer. To achieve greatness, you have to train hard. However, just playing soccer without knowing how to improve your performance won’t get you too far. Online Soccer Skills can assist you with your training sessions by providing 6 excellent programs designed for specific purposes. While conducting research for this Online Soccer Skills review, we were pleasantly surprised by the effort Coach Ben puts into all his programs. Online Soccer Skills won’t make you go through the same tutorials and drills over and over again. Instead, Coach Ben does his best to introduce new, innovative ways for improvement as often as possible. 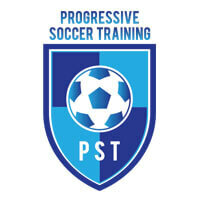 Every serious, dedicated soccer player can learn from these superb programs. With a program suitable for your age and skills, you can easily become the best player you can be. Coach Ben, you’re the best! Not only do I have your all-access pass, but I’m also subscribed to your YT channel and follow everything you post. What I like most is that everything is so simple when you’re showing it. Thank you for all the tips, I’ll keep following your work. ive learned so much from you, Coach Ben! as a girl that plays soccer I always feel a lot of pressure. that’s why i want to show everyone that I’m the best and that girls can play just as well as boys. you helped me become better! thanks you very much!! !